I’ve been hearing from so many of you asking for some tips on Pinup posing so, I put together what I think are 5 tips that probably all of you can do really well with just a little practice. There are some poses and some tips for looking your best in photos. 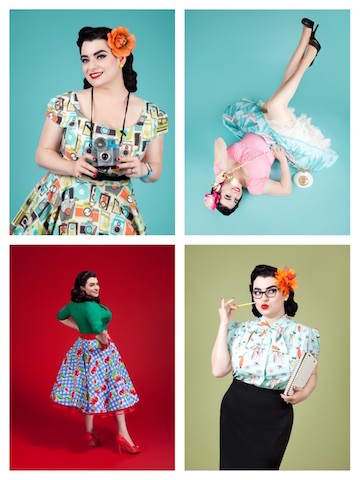 I’d love to see some of your Pinup pics where you are incorporating my tips!! Classic Pinup pose. You might want to get yourself ready by practicing because it can take a little work on your part to hold those legs up. This pose is terrific because if you are a little shy, you don’t have to show too much and the pose can be done very classically and elegantly as you can do it wearing a dress or skirt, it doesn’t have to be all lingerie. You simply lay on your back, place your arms either over your head or, use a prop like a telephone and it can be a nice way to show a hint of cleave while keeping it classy, and lift those legs, keep one a little lower and press them together. Great classic pose here. You can show off your beautiful outfit while you stand with your back to the camera and slightly turn your head to look over your shoulder. This can be a great pose to show off beautiful legs or derrière. Wear a pretty of shoes and the higher the heel the better. I love working with props. Props are great because they give your hands something to do and this is great especially if you are new to Pinup posing and are having a hard time ‘relaxing’ those fingers in photoshoots. Props also add another element to your pics and I think can make a shot really feel real because your are active and doing something. Props can be as simple as holding a purse or vintage camera. Pinup is all about over-the-top facial expressions. Big wide eyes, and lots of smiling. You have to smile with your eyes!! A great tip is holding your tongue pressed against the roof of your mouth as it helps with a double chin and slims the face. Practice saying the vowels of the alphabet and really exaggerate them….. one great tip when doing Pinup is, if the pose you are in is not uncomfortable or you don’t feel a little weird then you are not doing right. So, practice smiling, you want a big inviting smile, make sure your eyes are smiling too!! This one is a little difficult but, boy, does it make a difference in pictures. Pointing your toes when you are sitting or have a leg out for a picture looks incredible in the final photo. I suggest looking at pictures of Pinup models and paying very close attention to how their feet look and you will notice they are pointing their toes and it makes a lovely shape to the leg and foot. It is not easy to point your toes in certain shoes but you really must try to and you will love the end result.